Change your perspective by changing your altitude. Virginia’s Blue Ridge looks quite different from the heights of our favorite summits, and we know that a change in altitude can also cause a change in attitude … for the better. 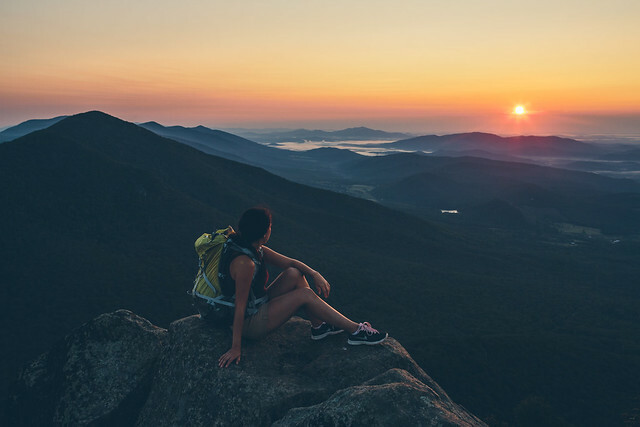 Come blow off some steam, breathe the fresh air, and conquer one or more of these 10 hikes to stunning summits in Virginia’s Blue Ridge. The ledge on Catawba Mountain that offers 270-degree views of mountains and valleys is one of the best landscape features you’ll find in Virginia. Or anywhere, for that matter. This summit is the most photographed spot along the 2,178-mile Appalachian Trail, and not incredibly difficult to get to. Starting at Route 311, the hike out and back is about eight miles. The Hay Rock / Tinker Cliffs Overlook Trail delivers a view of Carvins Cove Natural Area and the Roanoke Valley, as well as the ridgeline where the Blue Ridge Parkway winds through the region. The trip out and back by way of the Appalachian Trail is eight miles. It’s considered moderately difficult. Following your hike, enjoy a post-hike burger and beer at the Town Center Tap House. Tinker Cliffs on Tinker Mountain is one of three summits that comprise the Triple Crown of Virginia. Round trip, you’ll cover 7.5 miles and experience just about 2,000 feet in elevation change. Such a workout demands a sweet reward, and rewarded you shall be. The third “crown” of the Triple Crown is Dragon’s Tooth (the first was McAfee Knob), and it’s just down range from McAfee Knob off Route 311. You’ll know it when you see it, as it’s a huge rock outcrop that juts up from the land … just like a dragon’s tooth, perhaps. Plan to hike slowly and take your time; this one is challenging. 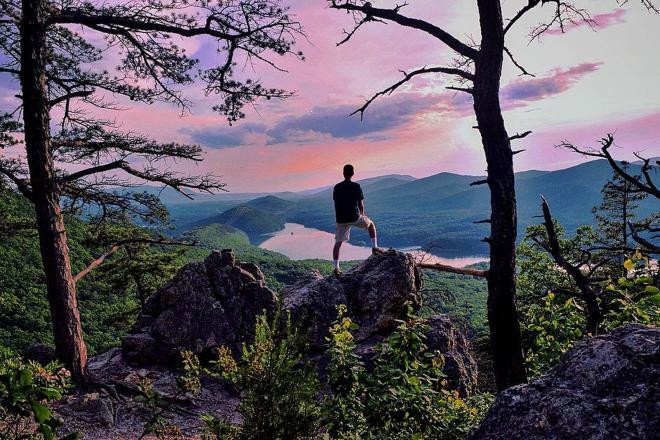 The most recognizable of the Peaks of Otter, Sharp Top was long-believed to be the highest peak in Virginia. Not so, but that doesn’t diminish the breathtaking 360-degree views from the top. You can hike this one or take a shuttle. Either way, it’s certainly a summit you will never forget. Move over, Sharp Top, Flat Top’s coming through. At 4,001 feet in elevation, Flat Top is the highest of the Peaks of Otter, but the less traveled. Bring your pup along to give you the pep it takes to make the 4.8-mile round trip. You’ll be glad you did, even if this trail is considered hard by some standards. Overlooking downtown Roanoke, Mill Mountain is the mountain to climb, mountain bike, and even drive when you’re visiting the city. Not only is the famed Roanoke Star waiting at the top, but so is the Mill Mountain Zoo. 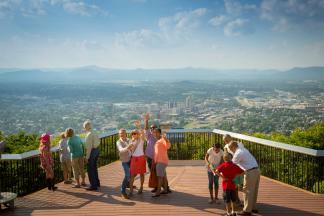 At nearly 4,000 feet, Poor Mountain is one of the tallest mountains in the greater Roanoke Valley. The preserve area features nearly four miles of trails that can be merged together for a fun loop that offers a beautiful summit view. You&apos;ll also encounter an abundance of piratebush, a unique shrub that&apos;s one of the most rare plants in eastern North America. The two mile climb to the summit of Read Mountain is known as Buzzards Rock and it&apos;s regarded by many local hikers as one of the most underrated trails in Virginia&apos;s Blue Ridge. It&apos;s part of the Read Mountain Reserve recreation area, which contains a 5-mile trail system that winds through 243 acres of forest. Where did you think Smith Mountain Lake got its name? 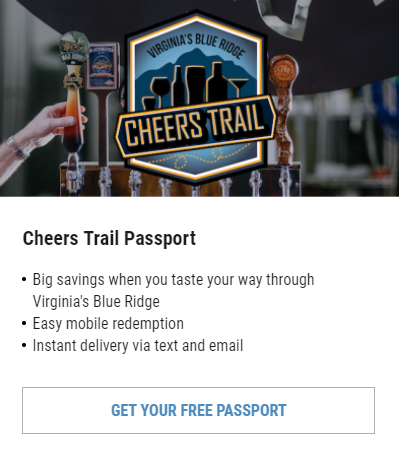 Smith Mountain, of course! So what about Smith Mountain? It is now Smith Mountain Cooperative Wildlife Management Area managed by the Virginia Department of Game and Inland Fisheries. It’s open to the public seasonally for hunting, fishing, and indeed, hiking. A fire road that runs the ridgeline is a hiker’s goal. The terrain can be steep and there aren’t any real trails to speak of. Until now, trailblazer. 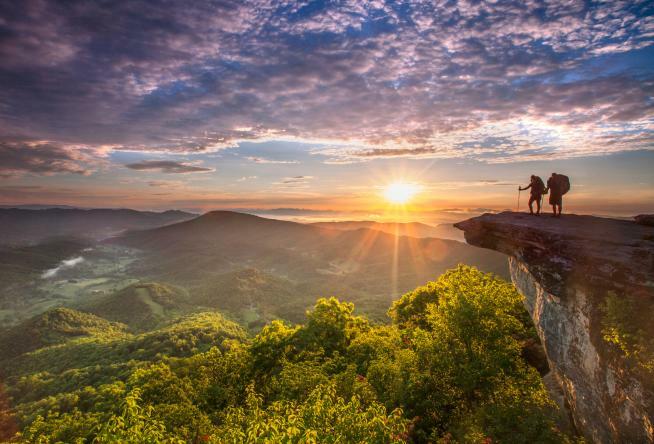 We love, love, love summit pics and we want to see yours as you reach the top of these peaks in Virginia’s Blue Ridge. Show off your views when you share to Instagram using the hashtag #BlueRidgeDay. For more great hiking trails, check out Hiking in Virginia’s Blue Ridge.